Hair – Sage Salon + Spa Inc.
Our salon’s stylists each have their own individual style to suit every client’s needs. 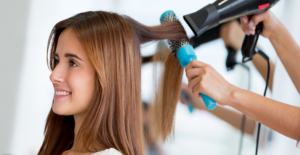 We also provide ongoing education for our stylists to ensure they are kept up to date with the latest trends and techniques. The knowledge they receive, they pass along to our clients to keep them well informed as well. We believe in using only top of the line hair products. Note: Prices for all colour/highlight applications are minimum general guidelines and are subject to consultation with your stylist.